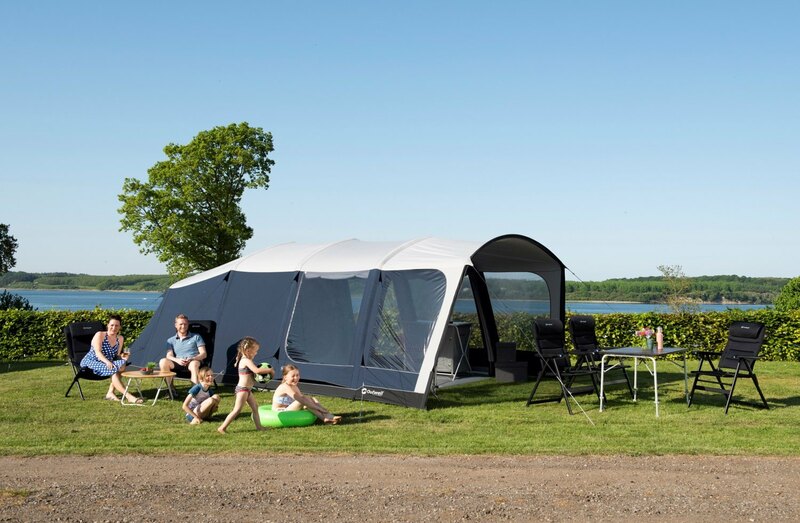 Outwell have entirely restyled the look of their tents for 2019 bringing a sleek modern look to the family tent. It’s a look that we first saw on our Outwell Tide Caravan Awning in 2018: streamlined with large windows. 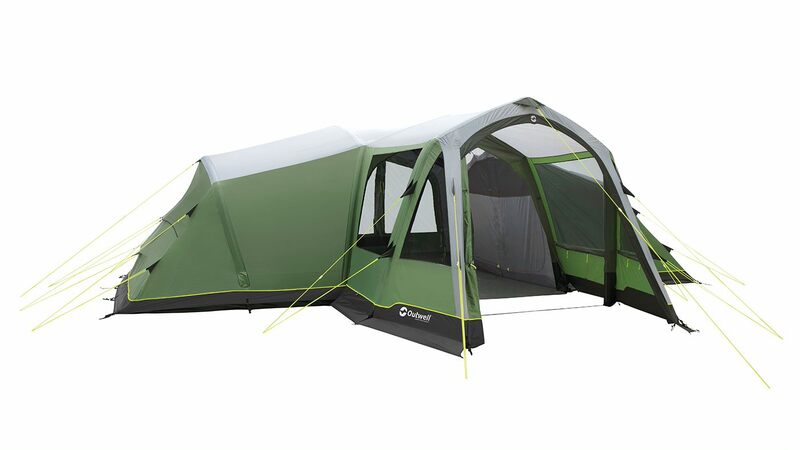 With the new Outwell PANORAMA, Outwell says that the large windows help bring the ‘outdoors in’ when you’re in the tent. And you know what, it works. The interior of the tents is very light. You’ll just want to pitch your tent somewhere with a stunning view! 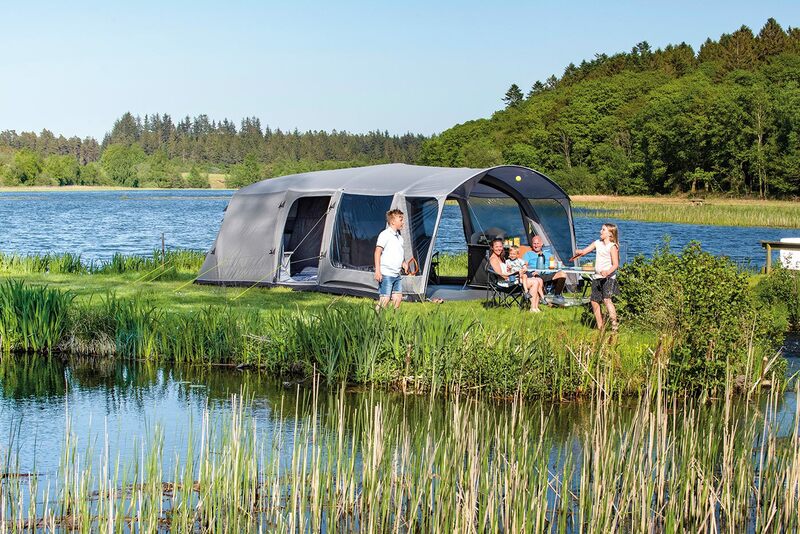 The new Outwell PANORAMA design brings more of that view in into your tent. You just need to pitch in a stunning location, like this! However, despite all these large windows, you are not on show to the rest of the campsite, as all of the windows are tinted, which give a reasonable degree of privacy. Despite the windows being larger, the tinted windows on this tent blend in to provide a modern, sleek look. Sometimes, you’ll find that the position of doors inside your tent doesn’t make the best use of space in the living area. 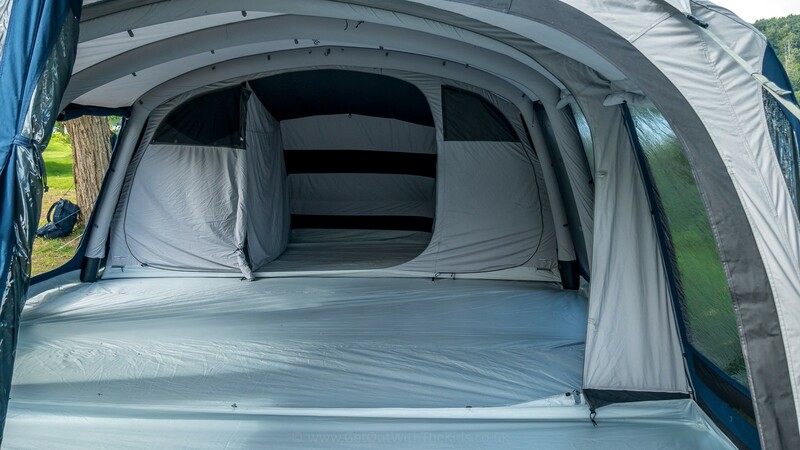 Outwell has looked at the door placement in their entire tent collection and repositioned the doors to to best make use of the space so that any tent furniture doesn’t stop you getting in and out of the tent. The two tent layouts on the left show a common problem, where placing furniture often blocks one of the doors. 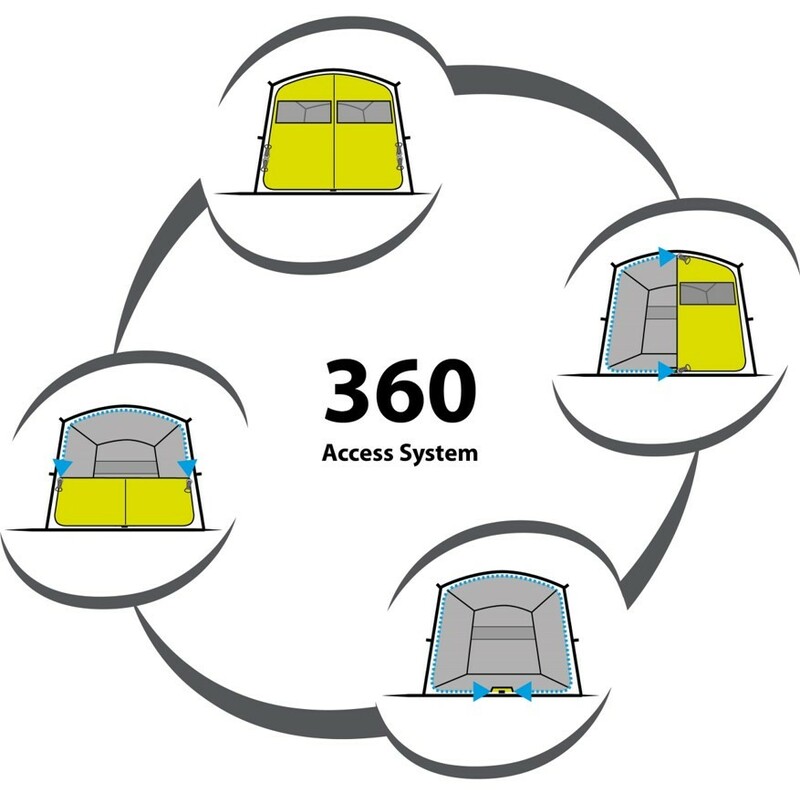 Outwell has analysed each of their tents and repositioned the doors to optimise their tent layouts in 2019, as shown in the diagram on the right. This was introduced last year (on the Ambassador Master and Premier bedrooms), but combined with the new PANORAMA design, this will really help ‘bring the outdoors in’. So now, you can lie back in your comfortable bed and take in the view! You can unzip doors in multiple configurations, including removing the door completely. A couple of tents in the collection with a distinctive look are the Outwell Middleton 5A and 8A, with their gothic arches and matching large gothic windows. The Outwell Middleton 5A will look very distinctive on the campsite this summer, with its gothic-arched entrance and windows. 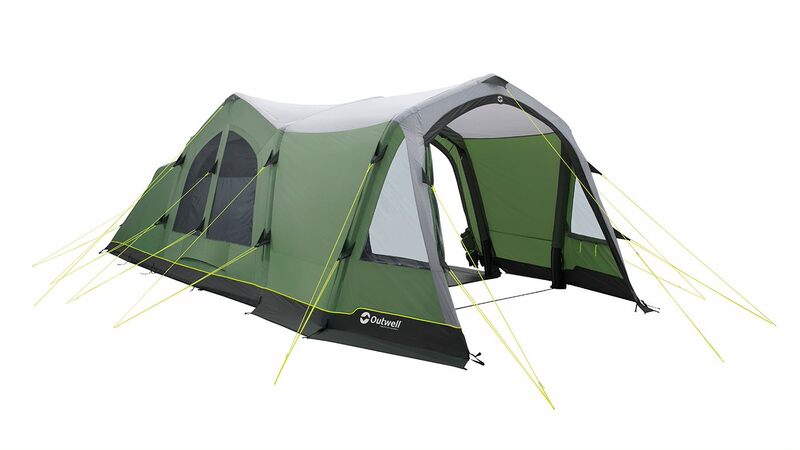 The Outwell Middleton 8A tent redefines the vis-a-vis layout and provides large gothic-arched living space. 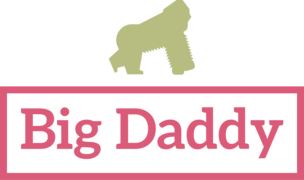 Visiting the Caravan, Camping, and Motorhome show?  Are you planning to visit this year’s Caravan, Camping, and Motorhome show? 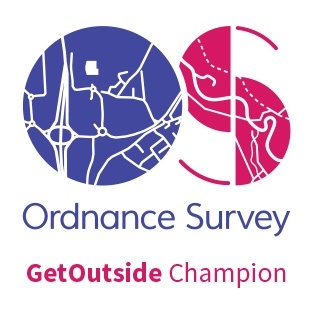 If you are visiting the show this February at the NEC in Birmingham, Outwell is planning to bring many of their new tents at this year’s larger camping area of the show. So pop along and have a look of them yourself. If you do, I’d be interested to hear your thoughts on this design update. Post them in the comment form below. The Cedarville 3A, Reddick 4A, Broadlands 5A, Chatham 4A and 6A, the Middleton 8A (the gothic-arched one in the photo above), the Woodburg 6A and 7A, the Mayville 3SA and 6SA (the one in the photo showing the new features), the Belleville 5SA and 7SA, the Rock Lake 5ATC and Stone Lake 7ATC (the one in the picture at the top of the page), the updated Outwell Montana 6P, and the Vermont 6P. Outwell will be in Hall 5. 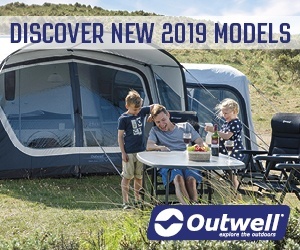 Check out some of our reviews of the new 2019 Outwell tents.